As the game clock struck zero at Atlanta's Mercedes-Benz Stadium following Sunday's Big Game between the Los Angeles Rams and the New England Patriots, the countdown to move tens of thousands of customers through Atlanta's Hartsfield-Jackson International Airport began. 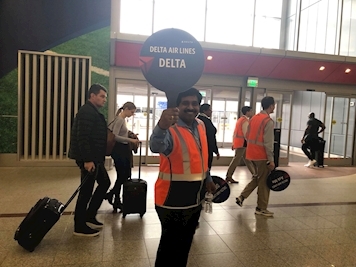 Beginning at 10 p.m. after the game, Delta's Peach Corps, a cross-divisional group of employees who volunteer to provide support to the airline's operation during special events, began a 28-hour continuous operation to assist customers from the curb to the gate. Peach Corps volunteers helped to maintain an orderly flow of customers to Delta counters and through TSA checkpoints as well as aiding them in navigating the world's busiest airport. Whether customers supported the Rams or the Patriots, Delta's customers leaving Atlanta following the Big Game took to social media to show that they were Delta fans, too. "Delta is legit crushing it at @ATLairport! Tons of personnel to direct you – only took 30 minutes to get through security lines with @Clear! Happy faces everywhere you look! Thanks, Atlanta, you've been a gem," raved one customer on Twitter. "With one of the world's largest sporting events coming to our town, we wanted to use the moment as an opportunity to promote Delta's brand and culture while supporting both our customers and employees," said David Groth – Program Leader - Business Readiness & Service Recovery. "We showed up and showed out for the world to see how Delta gets the job done – even during the country's largest sporting event. It was a tough 28 hours, but it was just as fun to see how big of a positive impact we had on our customers." Peach Corps members said they volunteered to help with the event not because they had to, or for personal gain, but because of their pride in the Delta brand. "We were all very excited to represent not only our city, but with the world's spotlight on us, we wanted to show all our customers, whether they attended the Big Game or not, how well Delta does business – even on a day like today," said Susan Offord a Peach Corps volunteer and Project Manager in the airline's Revenue Management department. While Delta people can celebrate back-to-back successful years hosting the Big Game in the backyards of Delta's largest hubs in Minneapolis-St. Paul and Atlanta, for the Delta team in Miami, the countdown for next year is now underway.